The Theme settings tab, located to the right of the Sections tab in the Theme editor, is where global changes to the look and feel of your Pacific theme are controlled. A Favicon (also known as a website icon, tab icon, or bookmark icon) is a small icon that represents your website and provides a shortcut wherever the icon appears. To match the look of your store, Pacific offers three controls for Icon thickness: Thin, Normal, or Thick. Virtually every color in Pacific is customized through the Colors settings. Add an optional Background image by clicking Select image. Images used here should be high in quality and detail in consideration for the amount of area covered. Using a 1920 x 1200px .JPG (.JPEG) image is advised. Select the swatch (rounded rectangle) for each element to assign a new color. For information about the Checkout page's color settings, jump down to Checkout. Choose from a variety of fonts through Pacific's Typography settings. Select Change under each Font box to assign a new font and font weight. Also adjust Base font size, Capitalization, and Letter spacing in these Theme settings. For information about the Checkout page's typography settings, jump down to Checkout. Pacific features an optional sidebar with assigned navigation menus. When enabled, it displays on the left side of your storefront. Enable it for All pages or All except the homepage, or disable it with the Enable sidebar dropdown. Select the menus that you want to display in the sidebar by choosing Select or Change below Menu 1, 2, and 3. The Product grid settings determine how customers can view and interact with your products on the collection pages and certain homepage sections. Use these settings to configure the Product text style (for product title, price, vendor) to display as an Overlay or Below image. Simply enter in your account information in the relevant Account field and the social icons will automatically appear in your sidebar. You can also connect to your email and enable your blog's RSS feed here. These icons can be featured in the Footer. Shopify works in virtually every country and every currency. With Pacific, you can cater to international customers with a currency converter that displays as a dropdown menu in the header of your store. This allows customers to dynamically update their prices throughout your shop. Enable currency conversion, then choose which currencies are supported and how they're displayed. Under Format, configure whether the currency acronym displays on product and collection pages (e.g. $10.00 CAD vs. $10.00). 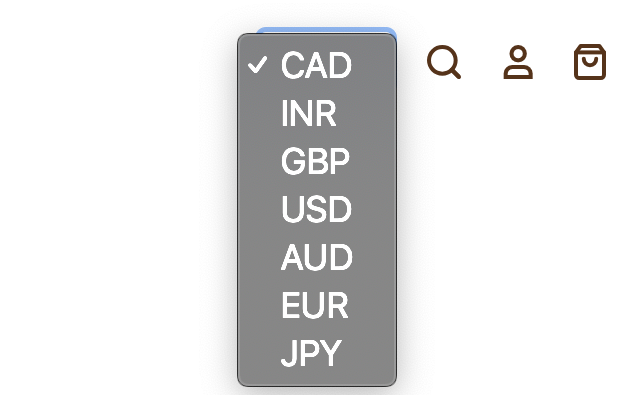 Under Supported currencies, you can select which currencies to display when browsing your store. Be sure to use the country's ISO currency code, and separate each with a space. Exchange rates used by Shopify are refreshed twice a day based on rates at XE.com. Under Checkout, add custom banner images, logos, and backgrounds, as well as customize the fonts and colors used throughout the checkout process. The banner is the top section of the checkout screen where your store name appears. Customize it by uploading a custom Background image. To add your store’s logo to the Checkout page, upload a Custom image. Then configure the Position and Logo size. The Main content area is the left side of the checkout screen where a user inputs their email and shipping address. To use a custom background here, upload an image. Alternatively, use the color picker to select a background color. There are two options for the color of the Form fields: white or transparent. The Order summary is the right side of the checkout screen where customers can review the details of their order. Upload an image or use the color picker to select a background color. You can customize the Colors that appear on the checkout page under Colors.